Would you like to live independently? The aim is to offer comfortable surroundings and live independently with the help and advice to enable you to make the right choice about items to help you live independently.If you would like to come and visit, our showroom is fully accessible including toilet facilities. We have a wide selection of products at our showroom on Chatsworth Road, to help you stay independent in your own home. The showroom is well stocked with eating and bathing aids, commodes and walkers, through to mobility scooters and wheelchairs. Kate and her team are available to help and advice you and if it is not in stock then it is easily ordered. 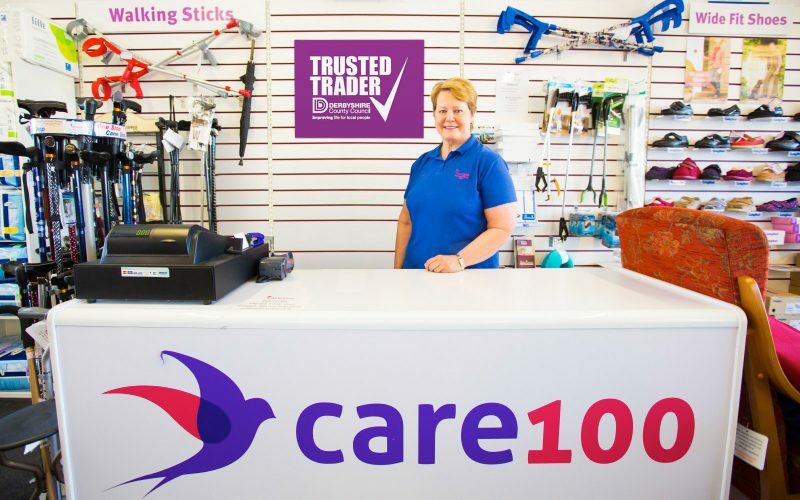 Care 100 stock wheelchairs and are able to offer specialist advice, fitting and measuring of the whole range of Invacare powered chairs. We are partners with Stannah Stairlift, and also supply Cosyfeet wide fitting shoes and slippers. Probably the largest selection of rise and recline chairs in Chesterfield. We are very happy to come and do demonstrations of products in your own home, but we NEVER cold call. We can also repair and service your mobility scooter. “If you can’t come to us, we’ll come to you”.